Early blight on tomatoes, potatoes, peppers and eggplant. Can it be subdued? Alternaria solani is the fungus causing Early Blight. Spring brings the rain, wind, and insects traveling from plant to plant plus a hidden visitor of Alternaria solani spores. Overhead irrigation, tools, infected seed and working in the garden when wet also support spore dispersal and growth. Rain splashing from the soil, carry these spores to your plants. Spores enter the plant through leaf surfaces or wounded plant material. The fungus spores can linger, producing many “seasons” of infection and take advantage of the hot, wet weather of late summer. 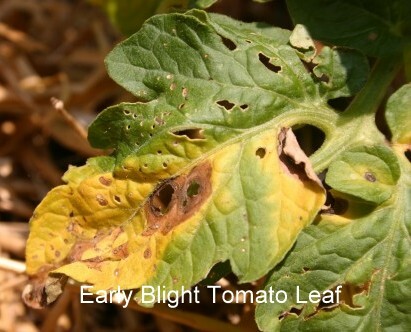 Early Blight is favored by warm temperatures and extended periods of leaf wetness from frequent rain, fog, or dew. Warm, humid temperatures of 75-86 degrees increase the likelihood of infection. Once the spores have “attacked”, infections have occurred and become the most important source of new spore production and rapid spread of the blight. Lesions generally appear quickly under warm, moist conditions on older foliage and are usually visible within 5-7 days after infection. 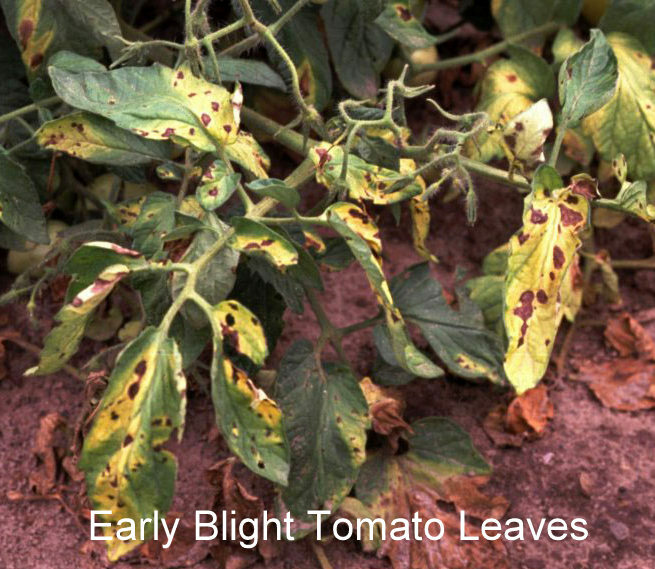 Early blight can develop quickly mid- to late season and is more severe when plants are stressed by poor nutrition, drought, other diseases, or pests. Dark spots will start showing on the older leaves of your tomatoes, potatoes, Bell pepper, hot pepper and eggplant. These spots will look like concentric rings. Spots enlarge becoming leathery, merge and leaves start to hang withered or fall off. Younger leaves will start showing black spots as well as the stems. As the leaves fall, the fruit has no shading and succumb to sunscald. This will also cause reduced fruiting as there is less leafing for photosynthesis. Infected fruit have dark, sunken, leathery spots near the stem end. Both green and ripe fruit are affected. Tomatoes will rot from the stem to the inside of the fruit. 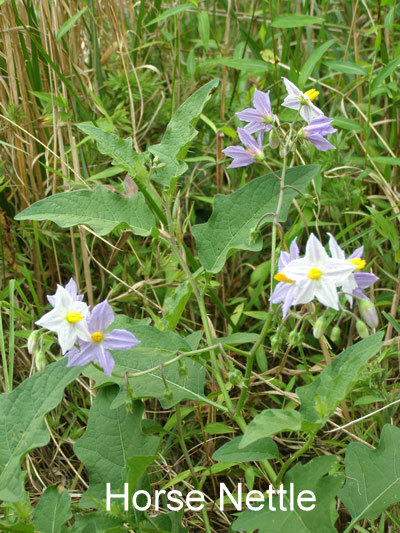 Tubers of the potato vine develop dark specks resulting in a corky potato. What can be done to stop this blight? Apply mulch (black plastic, straw, newspaper, biodegradable weed barrier) to protect the plant from spore splashing from the soil onto lower leaves. Remember early blight is a soil borne disease. Provide plenty of space between the plants. Good air flow will help keep the plants dry. Pick off affected/infected leaves and remove them from the garden, bagged; dispose with household garbage. Burning is equally effective. Wash your hands and/or gloves when you finish in the blighted area. Change your clothes to reduce further spore dispersal. Wash/disinfect any tools used in the blighted area. Use a biofungicide spray: Bacillus subtilis, (Serenade® MAX) and Bacillus pumilis (Sonata®) with compost tea. Read label for application. Copper products, hydrogen peroxide, and potassium bicarbonate can be used against early blight . Read the label for application. Garlic, neem oil and seaweed extract have also been shown to be effective in reducing the severity of early blight disease on tomatoes. Spray and apply as label directs. Do not work in the garden when it is wet after rain, morning dew or fog. Use drip irrigation as this will keep the plants dry. Rotate your tomatoes, potatoes, Bell and hot peppers and eggplant every three to four years with small grains (wheat, barley, rye, oats, sorghum), corn and legumes (peanuts, peas, cowpeas, green beans, long beans, runner beans, fava beans, soybeans, Southern peas, sugar snap peas). If you are limited on space consider container and vertical gardening giving your soil time to regain its health and decrease the spore population. Amend your soil with compost during late fall as it supports microorganisms that contribute to biological control in the soil. 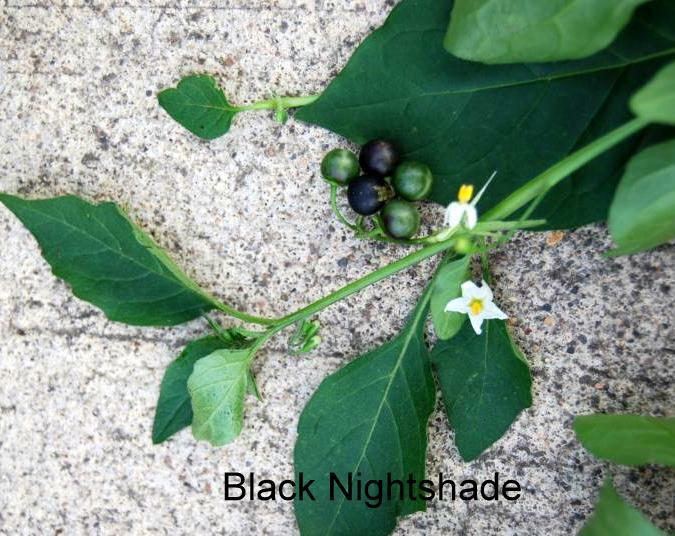 Nightshade and horsenettle serve as alternative hosts for the disease. Remove them from your garden area. Tomato stakes and cages should be disinfected (hydrogen peroxide or diluted bleach solution) and rinsed prior to storage. All dried plant material must be removed, bagged or burned. Be alert to weather changes. Become a plant detective. Get out to the garden daily and observe for any changes. You won’t be sorry as you are on the watch for disease. Removing leaves at the first sign of infection will slow the spread of Early Blight. Do not compost any diseased plant material. Do not save seed from diseased fruit as Early Blight survives within them. 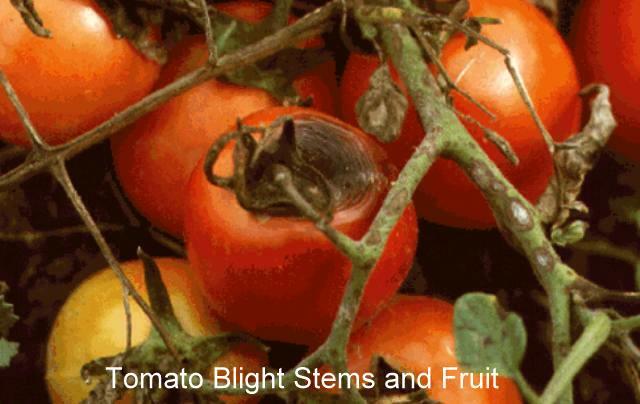 Are there Early Blight “resistant” tomato varieties? More like partially resistant. What is a good strategy for potatoes? Choose resistant varieties such as long season as they are usually more resistant – Certified seed potatoes. Choose a short season variety, plant early and harvest before Early Blight invades. Separate your potatoes from your tomatoes to decrease cross infection. Give wider spacing to access better drying and air flow. Be aware of the moisture in the soil. Do not over water. Yes, Early Blight can be subdued if you are vigilant. < Previous Fall garden progress! Two week update. Bookmarked this. Thanks for sharing! Glad to know this is helpful. Last year my tomatoes had Early Blight in mid-September as the drought had been severe. Glad to pass on my experiences with gardening.